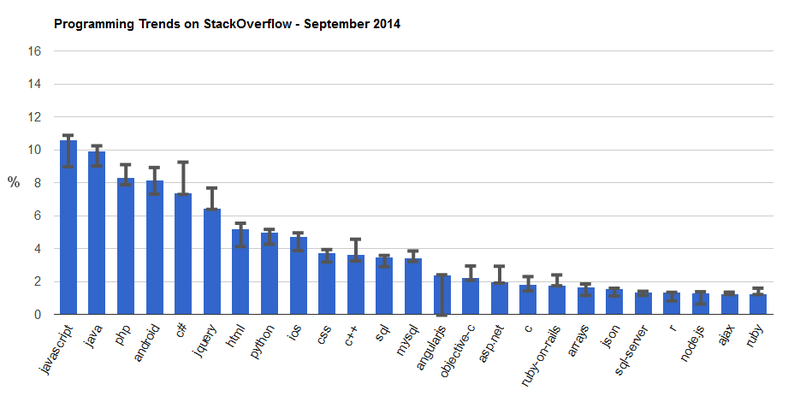 This animated bar chart shows the top 25 tags on StackOverflow each month, measured by monthly question counts. The y-axis shows percent and represents the proportion of these top 25 tags per month. The candlestick shows the minimums and maximums to date. The trends listed below refer to the proportion of the top 25 tags, as shown in the chart and not the absolute number of questions. You can see these trends by watching the animation and looking at the final chart, repeated below. I ran a forked version of lukasz.lew's StackExchange Data Explorer Query to collect the data. Here is the raw data in CSV format. The values in it represent question counts for each month (not a percentage, which can be easily calculated). Below is the final chart, September 2014. These number might be showing a maturing of the areas, since there is a point where most things have already been asked. Just like Wikipedia edits and new articles are down significantly because most of it is already written. Better numbers would be the number of up votes charted over the same time! Those numbers would be misleading as well because they are correlated with the amount of times a question has been asked and how good is Google at finding one of those answers when is what the user was searching for. Thanks for the comment, yeah a lot of folks believe the reason for the drop in C#/.NET in particular has to do with the StackOverflow site itself being started by .NET developers (Joel Spolsky and Jeff Atwood) and so originally the community was focused mainly on C#/.NET. It then took a couple of years for other languages and technologies to catch up to the level that C#/.NET had already attained. I think the decline in iPhone is more interesting as that falls into the "non .net" sphere that I would have expected to be increasing %. Dan, it is actually increasing, just notice the tag change, from "iphone" to " ios".